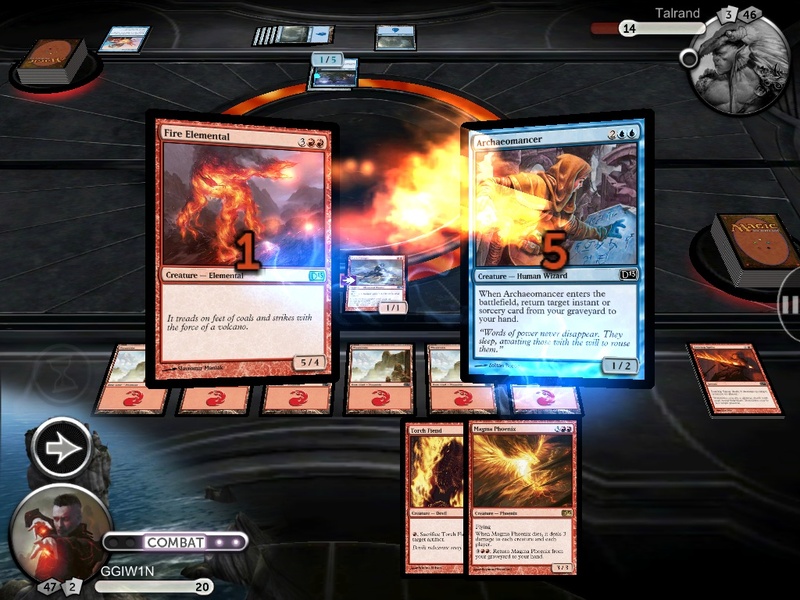 When it comes to introducing new players to Magic: the Gathering, nothing beats one of the annual installments of Stainless Games' Duels of the Planeswalkers.There have been a handful of updates with the latest version of the game, Duels 2013, including a new suite of ten decks to duel with, a few characters to introduce you to the Multiverse, and a new sort of Challenge called Encounters. When it comes to playing the game, this iteration is hardly distinguishable from 2012; the few notable changes come from the content itself, like the new format called Planechase replacing Archenemy mode . Duels 2013 is entirely enjoyable, but nothing particularly different from the earlier versions of the franchise. At its core, Magic is a simple game. You use lands to create mana. You use mana to cast spells. You use spells to reduce your opponent's life total to zero. Players cast these spells from their hand of cards, randomly selected from a deck of at least 60. Each opponent you defeat takes you one step closer to the final boss, the ultimate evil, Nicol Bolas. There's even a multiplayer mode, where you can battle your friends online, each with your own customized deck. The main difference between Duels 2013 and the actual card game of Magic is the limited number of decks. The decks introduced in Duels 2013 are fine for what they are , and seem to be well-balanced against each other, which is crucial to the longer term enjoyment of the title. I was disappointed to see that they've done away with some of the diversity in the decks from previous games, which is particularly relevant here due to the "manual mana tapping" addition to Duels 2013. Since so much of the marketing copy leading up to release was touting this new feature, where you decide which type of lands get tapped for mana when casting a spell, I had expected it to be at the forefront of gameplay. Instead, only one of the ten decks uses more than one color, so choosing which mana to use is usually moot.. While there is plenty of room to grow in expansions, I would have preferred to get to utilize the cool new features in the core game a bit more. Despite this, I still found myself quite enjoying playing with some of the new decks, which feature cards from the new Magic core set coming out in July. New in Duels 2013, Encounters expand on the concept of challenges in the previous games. Challenges are puzzles where you must typically figure out how to win the game in a single turn with only the specific cards in your hand. Sometimes they can be as simple as attacking with all of your creatures, while the more difficult challenges require intimate knowledge of rules and mechanics. Challenges were one of my favorite parts of the first two Duels, so I'm pleased to see that they get an increased presence here with a devoted section in Duels 2013. Encounters differ in that your opponent's deck is not randomized, rather they play specific cards in a specific order every game, but you're still playing an actual game, rather than trying to win in a single turn. You are working with a randomized deck, though, so there's still plenty of luck involved, rather than the 100% skill-based challenges. The new mode, Planechase, is a fun and challenging addition to the Duels repertoire. Planechase is a four player free-for-all match, which is already a very chaotic affair. Planechase furthers the sense of entropy by adding a six-sided die, which you can roll during your turn, with two action faces. One is the Chaos symbol, which triggers an immediate effect based on whatever the active plane is. The other is the Planeswalker symbol, where you reveal a new plane card that takes over the game. For example, when the Kessig planar card is active, non-Werewolf creatures deal no combat damage. With global effects like this changing every couple of turns, the whole game dynamically changes around them. Finally, we get to the most exciting addition of Duels 2013, the iPad! I've been playing the Xbox 360 versions of Duels since the beginning, and I didn't know what I was missing until I got Duels 2013 on the iPad. To be fair, for regular play I still use my Xbox, but when the roommate is monopolizing the television and I'm jonesing for some Magic, the option is there. Given that this is the first try with the iPad interface I shouldn't judge too harshly, but the point-and-drag controls seem to require extreme precision for certain actions. Attacking, for example, should be a simple matter of dragging your creatures forward, but I always seem to find myself struggling to point my creature to the right place on screen to initiate an attack. Despite the controls, however, I very much enjoy simply having a portable Duels to play while Jersey Shore defiles my TV. Bottom Line: Duels of the Planeswalkers 2013 is, for the most part, a carbon copy of Duels 2012. The Encounters and Planechase mode are welcome additions, but the lack of diversity in the deck options seems like a bit of a step backwards in an otherwise static continuation of the series. Recommendation: If you're new to the Duels series, and have even a passing interest in Magic, this game is definitely for you. If you've played the first two Duels exhaustively, however, this version feels a bit lacking.